Estate and Trust Litigation, which often (but not always) take place in New York Surrogate’s Court, arises when there is a dispute regarding a decedent’s estate or a trust estate, i.e., rights and obligations individuals have to property once owned by a deceased person or that is currently titled in trust. The dispute may involve the executor, administrator, trustee, one or more beneficiaries, or third parties, such as creditors or persons or entities in possession of property belonging to the estate. Daniel J. Reiter, Esq. handles all matters involving disputes and controversies in regard to a decedent’s estate or a trust estate. Some common forms of estate and trust litigation are Will Contests, Contested Accountings, and Turnover Proceedings. In New York, a Will must meet certain requirements to be valid. For example, the “testator”, i.e., the maker of the Will, must have the requisite mental capacity to make a Will. The testator must also make the Will free of restraint, undue influence or duress. It is also essential that the particular statutory formalities be followed during the Will execution ceremony so that a Surrogate Judge will determine that the Will is valid. To learn more about Will Contests in New York, you can visit Daniel J. Reiter, Esq.’s blog post entitled, “What is a Will Contest?”. Estate practitioners searching for information on interposing “mistake” as an objection to probate, are directed to Daniel J. Reiter, Esq.’s article in the Trusts and Estates Law Section Newsletter of the New York State Bar Association. Before a decedent’s estate can be settled (i.e., closed), the executor (or “administrator” if there is no Will) needs the beneficiaries of the estate to consent, or, in lieu of beneficiary consent, a Court Order. Beneficiaries are the people entitled to inherit the decedent’s money and other property. In very many instances, the executor or administrator must prepare and file an “account” with the beneficiaries. The account, if prepared properly, should tell the story of (1) what happened to all money that was in the estate when the executor was appointed, (2) what came into the estate after appointment, and (3) what went out of the estate after the appointment. Many accountings are poorly drafted, or, even worse, tell a story of fraud or negligence in managing property and funds. Beneficiaries have a right to contest the account in order to ensure they are receiving the money and other property they are entitled to inherit, and to protect various other interests they may have. Accountings are also often contested in the context of trust administration. The trust may require the trustee to account, but the accounting may tell a story of negligence, disregard, theft, or fraud. In a turnover proceeding, the executor or administrator of a decedent’s estate takes steps to compel a person or company to “turnover”, i.e., deliver to the estate, property belonging to the estate. Turnover proceedings also occur in the context of adult guardianship, where the guardian of an incapacitated person brings a proceeding to compel a person or company to deliver property to the guardian that belongs to the incapacitated person. 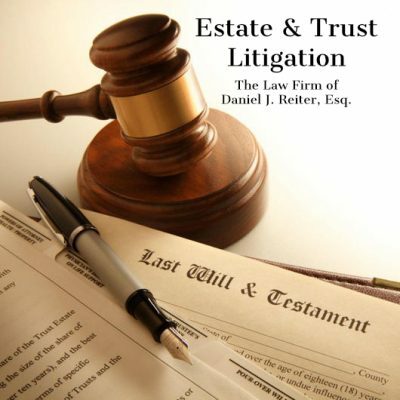 If you have questions regarding your rights in an estate or trust, or wish to resolve a dispute or bring litigation with regard to an estate or trust, you are encouraged to contact Daniel J. Reiter, Esq. at 646-820-4011 or djr@djrattorney.com.